Over the past couple of months I should have been getting my modules into a viewable condition for the show. But work and life in general has conspired against me. And more to the point, I was having a general lack of enthusiasm. Perhaps I have been a little slow to apply the best modelling advice – if you are stuck with one project, go and do something else. Well, I did that after a fashion, sorting out my old trains, and also with my wallet, building up my collection of UK stock. I looked again at my little ‘Earl’s Wood’ layout. A 4′ through station, then terminus, I nearly scrapped it, but didn’t have the heart, is it still looks good. 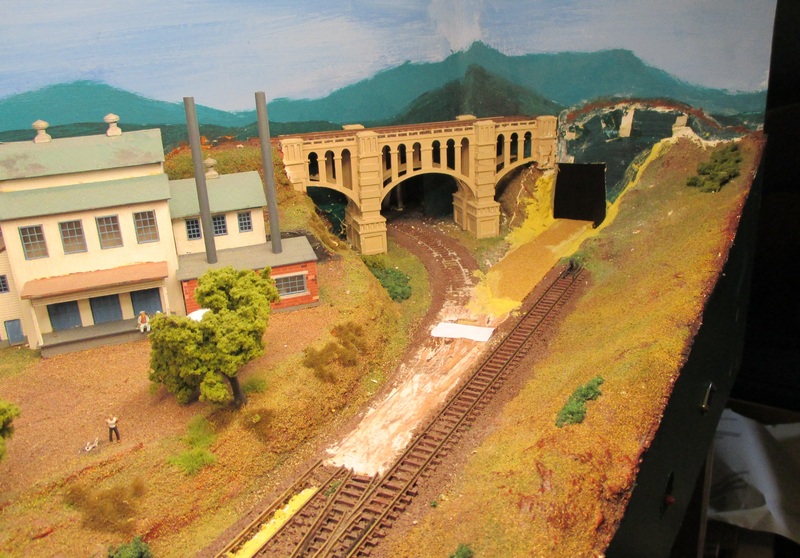 Its problem has been the fiddle yard, that lies behind the layout under the viaduct. I’ve had 3 fiddle yards back there, and none of them have been very successful. Partly because the layout stands up against a wall, at home or to exhibit, and the fiddle yard isn’t accessible. So I’ve done what I should have done a while back, and punched a hole into the outside world at one end of the layout. I was delighted to find that the PECO curved point that turned away under the viaduct could be simply replaced by a PECO large radius point. I also bought some new strip lights to illuminate the scene. Progress after a couple of days is shown below. The new track bed and the filling to repair the scenery have been added. The new exit and the non-sequitur with the viaduct will be hidden by vegetation and trees on the bank to the right. It shouldn’t be too visible from normal viewing angles. Next jobs are to paint out the new bits, put some scenery on the old main line, and then lay the track. The same point motor can be used, just moved a inch or so. And two wires are needed for power. The challenge will come with the fiddle yard design. Do I use points, the cassettes left over from a previous try, or build a new train turntable? I’m not sure at the moment! I have to admit, I’m enjoying this rebuild. Earl’s Wood may just reappear at the ESNG show to fill a corner, as I will probably be too busy to operate it.